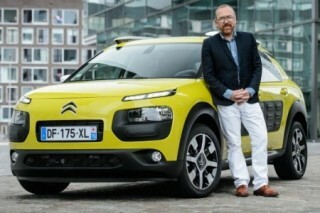 The new Citroen C4 Cactus is the car for the i-Phone generation. The technical masterpiece you can hold in your hand is now turned into something you can drive. It falls between the familiar C-sector hatchbacks and has more space than a usual B-segment crossover so it will pull in buyers from both, and even slightly larger cars for those downsizing. Citroen’s British designer (above) Mark Lloyd, whose parents come from Neath, is proud of his latest piece of automotive expertise on many levels. “I think it’s gorgeous to look at with its sweeping lines, floating roof and distinctive AirBump panels,” said Mark. “From the outset it was designed to be as lightweight as possible without resorting to expensive materials in the chassis or body. Externally, the eye-catching AirBump panels and bumpers either end in a choice of four colours are made of shock absorbing plastic sections like bubble-wrap which simply ‘give’ and return when subjected to low speed impact to minimise panel damage, and they can be replaced or changed for different coloured units. Fitted with a ground-breaking overhead airbag in the front to free up fascia space and fully digital 7-inch touchscreen it is very uncluttered and clean inside. Even the conventional front seats are replaced by a sofa-style bench on the automatic model, with its button selector on the console for gears, and the finishing touches include straps instead of door pulls. Conventional wind down rear windows are replaced by pop-out units to cut down weight and the specially glazed panoramic roof reflects heat while allowing in light. The attention to weight saving has trimmed 200KG from the equivalent Citroen C4 Hatchback but it also means the C4 Cactus rolls onto the road at 965KG, which is remarkable in this class of SUV. It uses 20% less fuel than the C4 Hatchback, directly as a result of the slimming formula. The lightweight means it can use smaller powertrains without sacrificing performance and maximises economy. One of those will be shown at the Paris motor show in October. 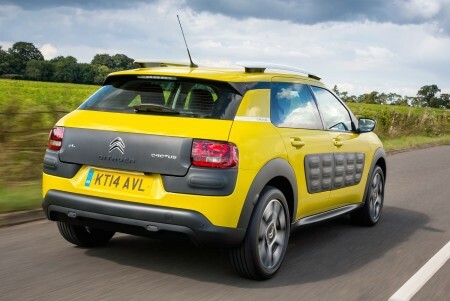 The C4 Cactus AIRFLOW 2L concept delivers breakthrough fuel consumption of 2l/100 km or over 141mpg using. Here, the design has been optimised with a 20% improvement in aerodynamics; lower rolling resistance “tall & narrow” tyres; lighter parts to reduce overall vehicle weight by a further 100kg and Hybrid Air engine technology, which cuts fuel consumption by 30%. The 13-model C4 Cactus range is available with three high specification trim levels – Touch, Feel & Flair – with prices starting from £12,990 for the petrol PureTech 75 manual Touch, rising to £18,190 for the ETG6 equipped e-HDi 92 Flair. Emissions range from 87 to 107gkm.. Engines available are 1.2 petrol three-cylinder units developing 75, 82 or 110ps with five speed manual or automatic boxes, and 1.6 four-cylinder diesels producing 92 or 100ps, matched to six-speed auto or five-speed manual transmissions. Citroen anticipate sales will be split approximately equally between the petrol and diesel engines and the low running costs and tax advantages will encourage about half the buyers from the fleet and business market. 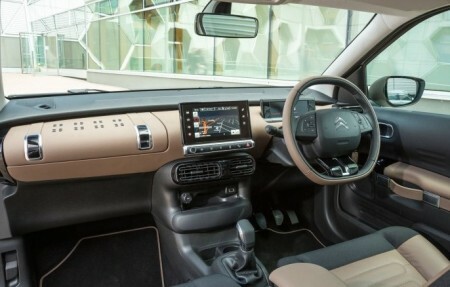 The best selling version is expected to be the £16,535 BlueHDi 100 manual with five-speed manual gearbox in mid-range trim and emitting 87gkm, but as it’s such new ground for this type of car Citroen believe this could change. Eye-catching, efficient, enjoyable, that’s the new Citroen C4 Cactus. There is nothing on the road like it to look at, but its not just stylish, it’s sophisticated. Citroen built its reputation on providing the 2CV basic transport for French country dwellers and also the bureaucrats who expected luxury in the DS series. I could feel elements of both in the new C4 Cactus. Its ride is supple and absorbing but not door handle dragging on corners. The boot holds 358 to 1170 litres and it has a high tail, there’s room for five, lots of oddments space and visibility is particularly good to the front. Seats are big and comfortable but the practicality of the Sofa on the automatic version tested is a little more doubtful if possibly desirable for some users activities. Our first stint in the anticipated best selling BlueHDi 100 diesel manual saw it return a remarkable 78mpg approximately but little did we know even more surprises lay ahead. Slipping into the 82 petrol with its automatic box and stop start technology we saw a best of 82.9mpg and averaged 80.6mpg with a ‘worst’ consumption of 76.2mpg over a mixture of country, main and dual carriageway roads. For a car of its size those are landmark figures that can be explained to a large degree by its lightness. The i-Phone altered telecommunications and now the Cactus will ring the changes in our motoring expectations.